Leading a healthier existence is critical to bringing about long-term addiction recovery. In place of old, unhealthy behaviors, people working a program are encouraged to make an effort to eat better and exercise. What’s more, experts strongly recommend giving up tobacco products for two reasons: nicotine isn't good for you and smoking is associated with heightened relapse risk. Many people who start a journey of recovery give up cigarettes in treatment, which makes sense; if a person is going to quit one bad habit, why not nip them all in the bud. In theory, abstaining from all harmful behaviors is sound, but in practice doing so isn’t always straightforward. Committing to giving up drugs and alcohol is an enormous feat, and some individuals find treatment and early recovery a less than ideal time to consider smoking cessation. As a result, a good many people in recovery still use tobacco products, vape pens, and hookah. In fact, a significant number of young people in recovery will get a group together to go to hookah bars after meetings, especially those living in cities. There are some who would argue that smoking hookah – a multi-stemmed instrument for vaporizing and smoking flavored tobacco – is safer than more common methods of nicotine intake. The less-harmful mindset may be the result of thinking that the water chamber in the hookah cleans the smoke from harmful toxins. 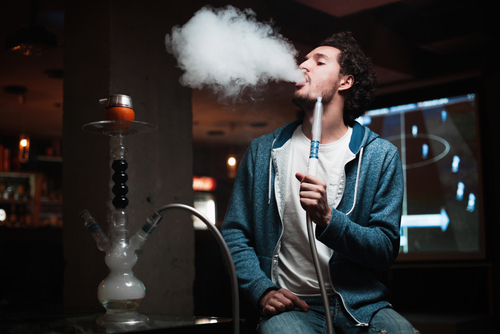 However, new research suggests that hookah carries health risks of which users should be made aware. People in recovery that don’t smoke cigarettes have been known to smoke hookah with their peers after a meeting. The activity, compared to past behaviors during one’s using tenure, may seem benign on the surface. But, nicotine and other toxins are being absorbed into the body from the tobacco, and a new study shows that hookah is harmful to the heart. Research appearing in the American Journal of Cardiology shows that a half-hour of hookah smoking led to the development of cardiovascular risk factors similar to traditional cigarette smoking, Science Daily reports. Participants who smoked hookah had faster heart rates, higher blood pressure, and increased measures of arterial stiffness. "Our findings challenge the concept that fruit-flavored hookah tobacco smoking is a healthier tobacco alternative. It is not," said Mary Rezk-Hanna, an assistant professor at the UCLA School of Nursing and lead author of the study. She adds, “We know that flavored tobacco products are frequently the first kind of tobacco product used by youth." In California, there are 2,000 shops selling hookah products and 175 hookah lounges and cafes (mostly in the Los Angeles area), according to the article. If you are in recovery and are committed to living healthily and mitigating the risk of relapse, spending time in hookah lounges is probably not conducive to achieving your goals. At Hope By The Sea, we offer clients several different levels of care, including detox, residential, outpatient, extended care, and sober living. Our team of professionals has the expertise to help you or a loved one bring about lasting changes and long-term recovery. Please contact us to learn more about our unique addiction treatment programs.